Early this year I’ve seen photos of Angel Locsin taken in all mountains she has conquered thus far. Angel is a local actress most famous for her TV roles. Her first bid for fame is her iconic portrayal of Pinay superhero, Darna. Now, Angel has been making raves on social media, particularly in numerous travel groups because of her penchant for mountain climbing. I remember looking at those photos and picking a mountain that I want to climb. This is how my Mt. Batolusong adventure came about; a climb that was inspired by Angel Locsin. But Angel has climbed numerous mountains so why Mt. Batolusong? I got one reason; sea of clouds. The closest thing that I had to this kind of view is up on the plane (that doesn’t count). There are two places more famous to catch the sea of clouds; Mt. 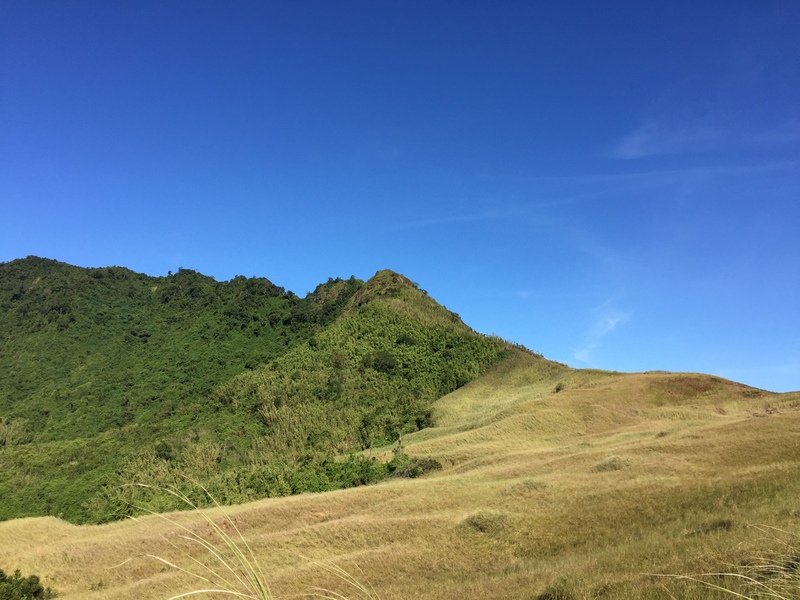 Pulag and Mt. 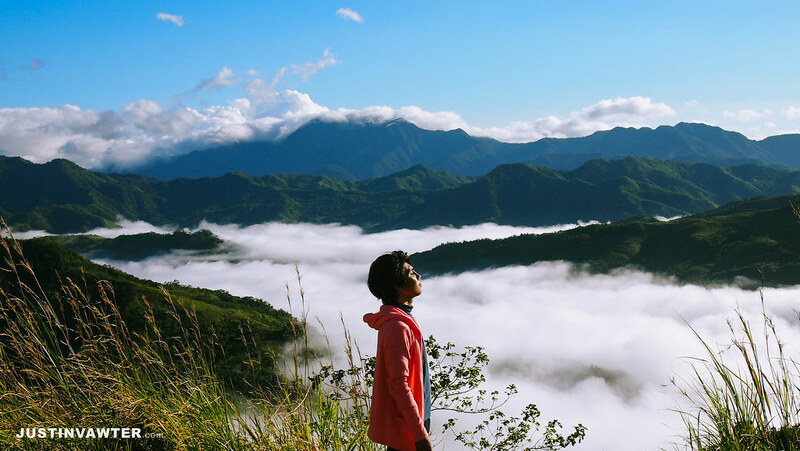 Kitelpan, both are in the Cordillera region. But why travel 8 to 12 hours away when there’s a similar view only 2 hours away from Manila? So I made it my mission to go to Mt. Batolusong, my first climb this year. Joining me in this trip are 13 others. Mt. Batolusong is in Tanay, Rizal, the jump-off point is in Barangay San Andres. It’s about 2 hours away from Manila. There are three peaks that you can climb in this mountain; Duhatan Ridge, Mapatag Plateau, and Rangyas Peak. Difficulty is set at 3/9 and the trail class is 1-3. Time is crucial to catch the clouds according to my research. You have to be there at the crack of dawn because the climb takes 2 hours and the sea of clouds disappears as the sun rises. Because of this I was very adamant that we all leave on time. Our meeting place was set at a McDonalds in Cubao, 2:30 a.m. I told them that whoever is late will be left behind; I was dead serious. In fact there is one person who got left behind. The others arrived on time and so we left for Cogeo at 3 in the morning. What happened next were a series of mishaps. First we took a shuttle that goes to Cogeo. We were dropped off on a gas station and were left wondering what to do next. A group of men talked to us, one of them trying to promote the idea that we rent a jeepney instead. There’s this older guy who was trying to join in the conversion. The problem is he spoke in such gibberish that nobody was able to decode what he was saying. We soon realized that the old man was drunk. And the younger guy who was trying to make a deal with us? Turns out he didn’t own a jeep and the drunk guy is the jeepney driver so we should ask the latter if it’s ok with him. I was like, why the fudge would you waste our time trying to cut a deal for something you aren’t even sure about? That was like 20 minutes of our time wasted so we moved along. One of us, Miriam had the mind to open the itinerary that I created on her phone. Admittedly this was my sabaw moment. I created an itinerary for this trip, which I even posted on our FB event so why the hell did I not think of checking it? It could have saved us a lot of trouble if only I did. Lesson #1: Thou shall follow the itinerary. So we walked the length of Marcos Highway until we reached an intersection. We continued our walk along Ulalia Road and saw a terminal of jeepneys in the corner of NHA Ave. These are the jeepneys that go to Barangay San Andres. What came next is almost an hour of traveling in the cold. The wind was blowing through the open window of the jeep, freezing everyone inside. It wasn’t as cold as the weather in Taiwan but cold nonetheless that the entire ride was anything but comfortable. 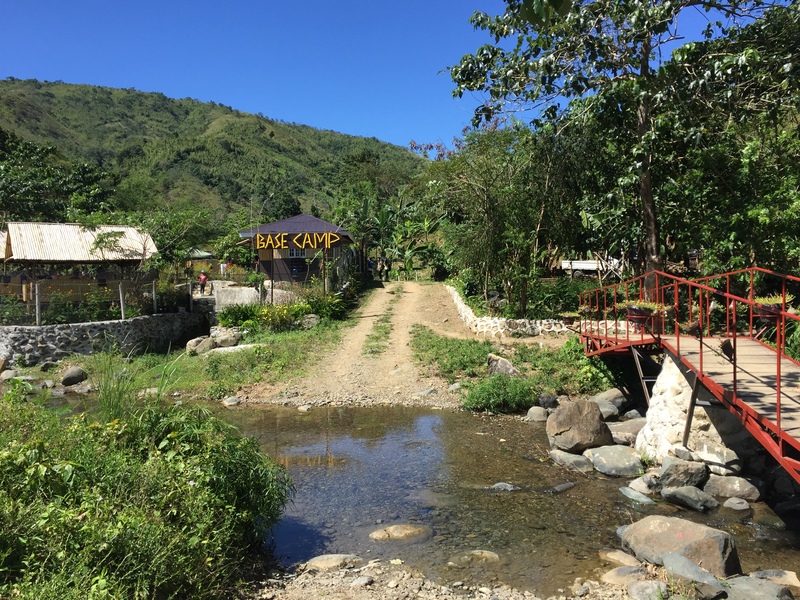 We put off at Barangay San Andres and took the trike to get us to the jump-off point. Registration is at the barangay hall with a fee of PHP 40 (USD 0.80) each. I told everyone that we should climb as quickly as we could so we wouldn’t miss a sea of clouds. Our guide was also quick to burst my bubble. And just like that my dream shattered into million of pieces. My disappointment echoed by the rest of the group who were also encouraged to go on this climb for the same purpose. With no more sea of clouds waiting for us, we trekked in our own pace. I find the climb fairly easy but I’d be lying if I say that I didn’t question myself for doing this. But I think I have gotten better with time and I also listen to my body. If I had to catch my breath I would stop. This is not a race. Even if if takes me forever to get there, it’s better than to force myself. Because I took my time I had several moments when I was able to appreciate the view. There are three summits on Mt. Batolusong. 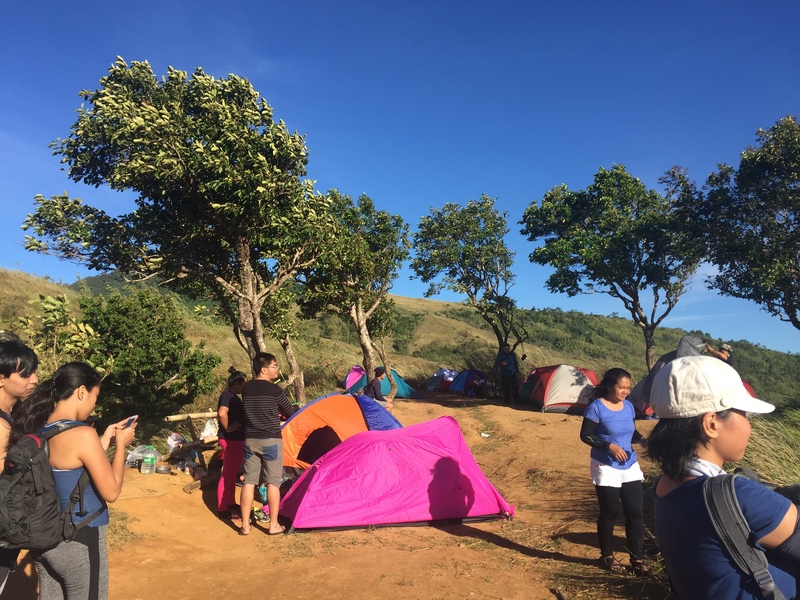 The first summit is the Duhatan Ridge (590 m) where you can go camping. Here we saw climbers taking a rest inside their tents, taking photos, or eating some snacks. Reaching the first summit takes an hour or so, depending on your pace. It would take another 1 hour to reach the second summit. Here, the wind is a bit stronger hence there aren’t many people camping here. This is where half of our group stopped to take a rest while the other half continued to the third peak. I decided to stay because according to the guide, the path to the third summit is perilous and quite difficult to climb. I remembered my failed attempt to reach the summit of Mt. Pico de Loro and thought that I’d save myself the trouble. We didn’t have a tent so we pitched our umbrellas instead and waited in what little shade it could offer. The third and last summit is Rangyas Peak. I can only show you how it looks from Mapatag because as I said, I skipped this part of the climb. After 30 minutes, our friends have returned. They all said that the path to the 3rd summit was nothing compared with the Mt. 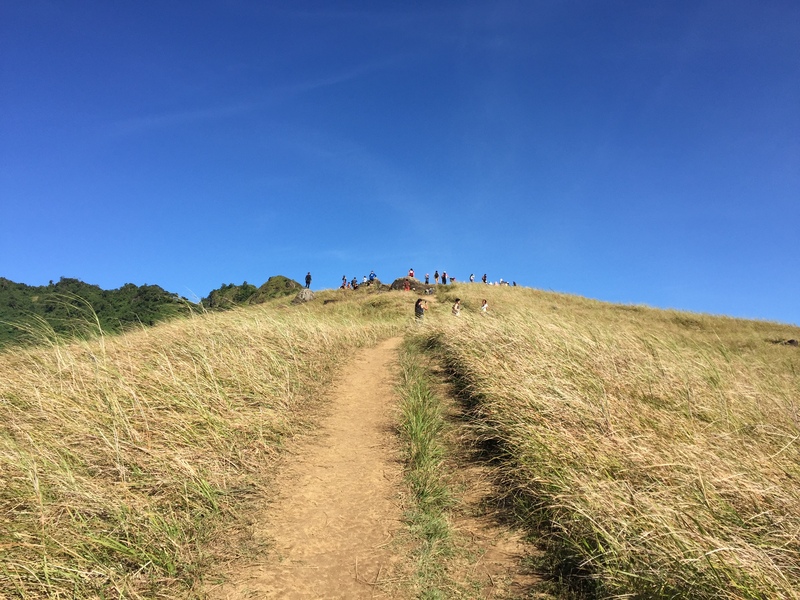 Pico de Loro summit. They told me that anyone can easily reach the peak, you just have to wait for your turn because the space up there is small that it cannot take much people. Had I known that it would be easy I wouldn’t have passed up the opportunity. Lesson # 2: Don’t knock it til you try it. Kay-Ibon Falls is the usual side trip when climbing Batolusong and that’s where I wanted to go. The guides though were adamant to take us to the base camp. I truly believe that the base camp is a tourist trap. First of all, they would take all tourists there at the beginning of the climb. I mean it should be a side trip, not a destination, why would you take climbers there before the trek? My companions didn’t mind checking out the base camp, but I did. I told our guide that we would check it out after the climb, not before. The guide had no choice but to follow my wishes. Up in the mountain I told them that we want to go to Kay-Ibon. One of the guides reports that Kay-Ibon is closed off from tourists. The other guide on the other hand, reasoned that Kay-Ibon doesn’t look as good as the cave, which is what they recommend. See what I mean by tourist trap? They want to promote the base camp so bad they would even lie to us. I find it ridiculous that they are not even aligned with their stories. I told them that I’d still prefer to go to Kay-Ibon. But do you know where the guides took us? To the base camp! Our decision they deliberately ignored! And the cave that they are so proud of? It’s very small and the water so dark, that nobody in our group go for a dip. The base camp itself is not all that bad. If you want to eat, rest, or take a shower, this place has the amenities. If I were you though, I’d skip this place. You can just shower at home, Rizal is not that far from Manila anyway. Also, you can eat better food outside. There goes the story of my first mountain climb in 2017. Notwithstanding the fact we didn’t see the sea of clouds, the beautiful view of the mountains, the grassland, and the company of my friends made it all worth it. You may view or download my Mt. 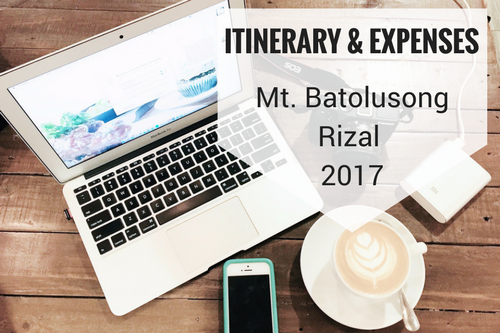 Batolusong itinerary by clicking the image below ↓ . Too bad about the wrong time of the year, but as my friends in Colorado say “A bad day in the mountains is better than a good day in the office!”. Hopefully we’ll see a repeat post next April when you do it again to see the clouds! I think I will have to pass haha… There are other mountains here that offer the view of sea of clouds. But next time of course, I will research first when is the best time to go so I wouldn’t miss it again. It does not sound to be your best climb since you did not see the sea of clouds. However, the views around look awesome. Too bad that your guides did not really follow your request at the end. They are too pushy about the base camp. You are amazing for climbing mountains and reaching the summit. I have never climbed a mountain and I wanted to do it at least once. You just inspired me to push myself more. I think I have said ‘no’ so many times because I thought i can’t do it. Truly, we’ll never know until we try. Thanks for sharing your experience and your lessons. Seems to be a good trekking spot! With all those amenities climb should be fun I assume. I liked the break up you have given, it gives a clearer picture. Perched high up on a mountain and watching the white, fluffy clouds floating below you, must rank as one of the most sublime experiences. I can understand your excitement of getting to the Batolusong mountain. Pity you missed the peak, but I am sure you will get there again. Mapatag Plateau, Rangyas Peak and Duhatan Ridge are all beautiful. One should visit all the summits in Mt. Batolusong. Ample information is provided. I would like to visit Philippines soon. It’s so cool that your climb was inspired by a Pinay superhero. And it was a great climb with fantastic views. It definitely inspires us to climb Mt Batolusong too.